The King's Gardens. Springtime in all its glory. Copenhagneners have been hanging out in these gardens in the city centre since the early 1700's. After an afternoon on a blanket with the one you love, it's time to move on. Perhaps a cracking Friday night awaits. Roll up your blanket and put it on your back rack. A light summer dress over your bikini and gladiator shoes are perfect for cycling. Off you go, along the safe, separated bike lanes. Heading off into the weekend with the one you love. Stopping for red lights need not be an irritation. You can exploit the wait by leaning in close to the one you love. Although if you wish to stay in the King's Gardens, you can always order cocktails that arrive by bicycle. Nice! 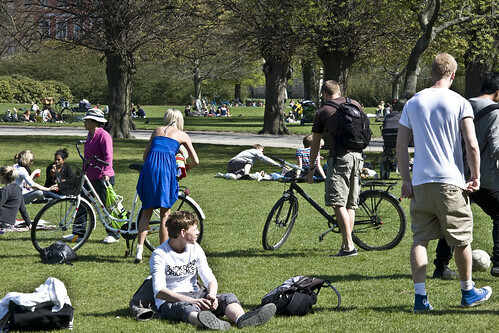 I saw a group meeting at a park in Copenhagen years ago. So many people biked to event - http://tiny.cc/LkthV. As much as I love these pictures, they make me a little sad. There are many of us who are trying very hard to get bike lanes through my neighborhood, and we get subjected to quite a lot of ridicule and verbal abuse. One argument against is that we don't need to worry about carbon reduction because electric cars are coming : ( Seeing others enjoying their bike lanes sometimes reminds me of how much energy I end up wasting trying to get stupid lines painted on roads. Back to the regularly scheduled gorgeous bike life of this blog. this blog isn't supposed to make people SAD! but i understand completely. It was a momentary lapse in my otherwise sunny and pleasant disposition ;P I am back to my usual piss and vinegar and am ready to roll! I would not call this safe, as the woman appears to be riding in the door zone. Definitely at least in the startle zone. Or perhaps Copenhagen car passengers are so well trained that they never open a door in front of a cyclist. Your last comment is the correct one. "Watch out for bikes" is what kids hear when getting out of cars from the age of 0. I said it twice today with my son while we were walking around town.